WF-8735 model converters provides 35Adc output, and a highly reliable nominal 13.6 Vdc with or without a battery, no extra filtering is required. WFCOs three-stage battery charging results in longer battery life, and is totally automatic. Nominal voltage output modes are a 13.2 Vdc float mode, 13.6 Vdc absorption charge mode, and a 14.4 Vdc bulk charge mode. Short circuit and reverse polairity protections provide you with further reliability and peace of mind. 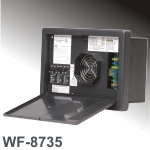 The cooling fan for the WF-8735 operates only when needed and ensures quiet operation. Front cooled fan installation does not create additional installation space requirements.